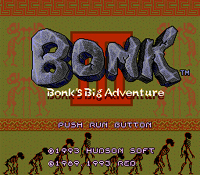 The hard-headed hero is back for more side-scrolling action in the third installment of the popular Bonk series. It's up to Bonk once again to thwart the plans of the relentless evil King Drool. There are seven rounds scattered throughout the Dinosaur Kingdom, each one filled with fun contraptions and comical enemies. Grab a Flower Copter or exchange 16 Smileys at the end of each round to play up to eight different bonus stages. Or you can change the size of Bonk by grabbing the new red or blue candy items. 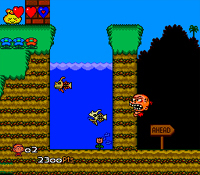 Depending on the situation, you can change your size to bonk your way through a dead end or to get a hard-to-reach item. And if that's not enough, you can grab a friend and put your heads together to defeat King Drool in the new two-player mode.